Spice Island Tea House is a small Thai restaurant tucked away on Atwood Street, just a few blocks off Forbes Avenue. Its traditional Southeast Asian menu, wide variety of tea and charming atmosphere make Spice Island worth the trip. Students tend to settle for the likes of Szechuan Express and other Oakland Avenue eats when they’re craving cheap Asian food, but, if you’re hankering for something that’s slightly more upscale, Spice Island is your South Oakland oasis. 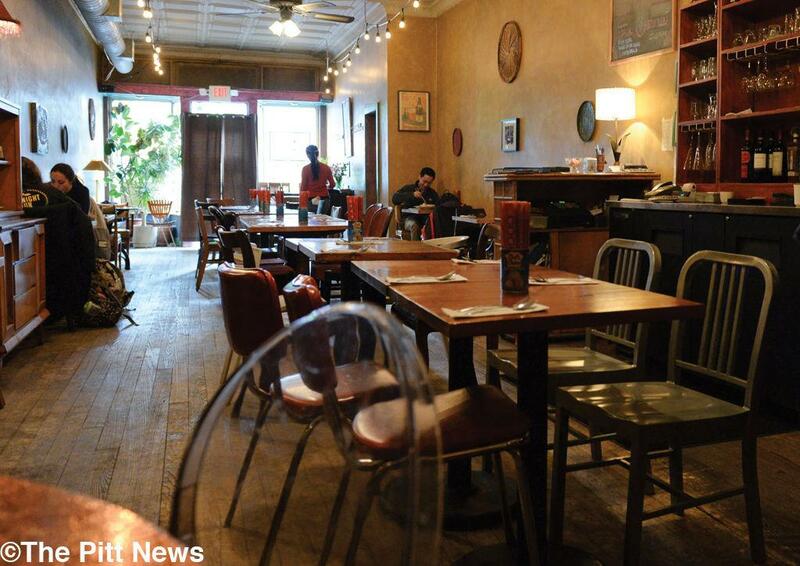 For high-quality taste as well as large portions, Spice Island provides a casual atmosphere with old wooden furniture, dim lighting, dark curtains and reasonable prices — most plates cost around $10. Spice Island just returned from a three-month hiatus as Hawker Stand — owner Ron Lee didn’t want to go by the original name while chef Hai Jing Leong recovered from foot surgery. In addition to a sprawling menu of noodle, rice and soup bowls, grilled meats and salad, Spice Island offers an extensive lineup of Chinese, Japanese, Indian and Sri Lankan teas. For those of legal age, the restaurant has a long list of wines, ginger beer cocktails and fizzy wine cocktails. The Pitt News’ Britnee Meiser and Meghan Bray pulled back the curtain — literally, the entrance is masked with a wooden curtain — on the restaurant to give readers a look inside. Britnee: I love my Asian food with a little bit of spice, so it’s a wonder that this was my first trip to Spice Island. Upon entering the restaurant, I was initially struck by the mellow atmosphere. Everything and everyone was so laid back — the subdued lighting, the friendly wait staff and the earth-toned décor set the mood for our meal. I was also surprised by the space’s size, because, from its exterior could fool you. As for the meal itself, I ordered the Thai ruby red basil sauce with chicken and steam fried rice for $11.50. The sauce includes onions and bell peppers, giving it just enough spice to be noticeable but not overwhelming. You can customize the level of spiciness, of course, based on personal preference. I tend to be monotonous when it comes to what I order at Asian restaurants — or any restaurant, really — which makes me something of an expert on this type of dish. But this Thai sauce was the best I’ve ever had. Service was quick, the mellow instrumental music was comforting and the portion size was bountiful. I got the lunch special portion, and it was still too much for me to eat in one sitting. Meghan: Like Britnee, I prefer my Asian food with a spicier kick to it, so, naturally I gravitated towards the spicier options on the menu. I decided on Thai basil fried rice for $10.50, which included onions, bean sprouts, peas, fresh basil leaves and spicy minced chili peppers. The dish also included shrimp, but I opted out of that ingredient. The dish was a good combination of veggies and rice, but was disappointed by the lack of flavor of the rice and the lack of spicy minced chili pepper. To compensate, I added hot sauce. As far as the atmosphere is concerned, it was comfortable with dim lighting and quiet, uncrowded seating. I thought the menus were a little unkempt — they weren’t laminated and, therefore, weren’t very clean. Their service was timely, and the server was friendly. The prices were reasonable, considering the portion size and atmosphere. Although Spice Island isn’t as close to campus as the Oakland Avenue fare, it certainly warrants the extra walk.